AIR Niugini has sacked eight pilots for allegedly taking part in a “politically-motivated” stop-work in July which caused flight delays and cancellations. They are Captain Joe Kumasi and First Officer Boris Ageda (Boeing 767), Captain Ben Lopa and First Officer Elijah Yuangi (Boeing 737), Captain Vince Tongia and First Officer David Sekan (F100 and F70), and Captain Norman Daniel and First Officer Abel Kanengo (Dash-8). Kumasi told The National yesterday that they received their termination letters from Air Niugini last Thursday, the eve of independence anniversary. Air Niugini chief executive officer Simon Foo yesterday said the eight were sacked as “disciplinary measures” by the company. Foo said from July 13, 2016, the airline had “experienced an unusual increase of national pilots reporting sick and therefore unable to attend work”. He said there was a call for stop-work in various sectors including the aviation industry by the “aviation fraternity”. It was allegedly to support weeks of protest by university students who were demanding that Prime Minister Peter O’Neill stepped down to allow police to investigate allegations of corruption against him. Foo said the stop-work was “politically motivated and began on July 13, 2016”. “The sudden increase in the number of national pilots reporting sick and unable to attend work from July 13 to 20 affected Air Niugini flights,” he said. “The airline customers were greatly affected during this period. Air Niugini experienced numerous flight delays and cancellations,” he said. 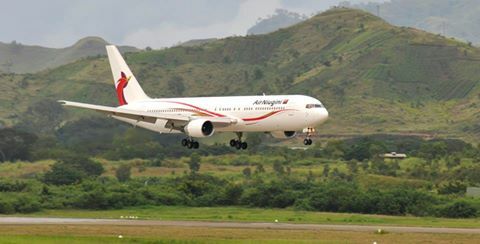 “Consequently, Air Niugini’s image and branding was severely tarnished, losing valued customers to the opposition airlines both domestically and internationally and incurring significant financial loss. “Apart from the core group of national pilots, all other employee groups attended to work as normal – the ground staff, aircraft engineers, flight attendants, expatriate pilots and other national pilots. “All those pilots who reported sick were requested to see the Air Niugini company doctor to verify their medical conditions as a second opinion, with all costs to be paid for by company, as due process because so many pilots reported sick on July 13, 2016 and onwards. He said the airline management, under the circumstances by way of due process and duty of care and to satisfy its safety requirements, had to carry out such a process. “As a result of this event, management has reviewed and applied appropriate disciplinary measures to the staff concerned,” he said.